Ann Kelle for Robert Kaufman Fabrics! I'll be watching for your interview with Kimberly tomorrow! In the FQS Black Friday sale I especially like the Persian Skies Grand Bazaar Fat Quarter Bundle. That sale could be dangerous to my credit card! Your patterns look wonderful, thanks for the chance to win. I love the Swoon Quilt kit! What a great deal on the Northcote Range fat eighth bundle! I love the Cape Ann fat quarter bundle! I follow your blog as a google RSS feed subscriber. Thanks for sharing! I am so loving your new patterns. Keep up the good work, lady! My fav item in FQS's Black Friday Sale would be the Puttin' On the Ritz grey layer cake. Love those prints. Thanks for being so generous! Your newest patterns are wonderful 🙂 Congrats! And pick a favorite? Impossible… but the Jovial bundle is calling my name the loudest right now! I like the Michael Miller orchid grey fat quarter bundle. I follow your blog 🙂 Thank you for a chance to win some of your Sweet patterns! My favorite is the Reindeer Games fat eighth bundle. My favorite is A Tisket A Tasket Quilt Kit. It caught my eye in the magazine back in the summer. I'm a follower! My address is shari at crop 247 dot com. As soon as I opened up the Black Friday Blowout special, I immediately saw the Amelia Fat Eighth Bundle. I love this line with all the pinks and purples and lots of flowers. That's my pick. Well…lots of favorites! Because I'm cold and it seems snuggly and warm, at the moment my favorite is the Cape Ann Brushed Cotton Fat Quarter Bundle–would make a wonderful snuggle quilt! 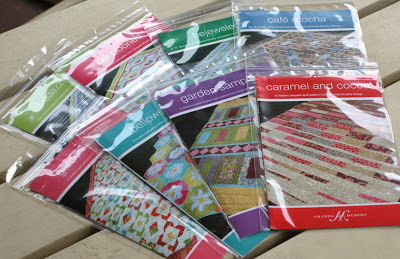 SO many gorgeous bundles of fabric, but I like the 2011 Kaffee collective fat quarter bundle. Thanks for the giveaway. I would have to say my favorite is a tie between Square Dance and the Tisket Tasket Basket quilt kit the most. Thank you for the chance to win some patterns! I am gonna have to say the square dance quilt kit! Would love to make it! My favorite is Home Sweet Home quilt kit. After much consideration and narrowing down favorites, I think I would choose the Swoon Quilt Kit. Might as well start the new year off with a swoon! My fav is the Square Dance Quilt Kit. I Love Love Love that Pattern and the colors are wonderful! I love that Garden Jewels kit. Thanks for the give away. I follow of course! and I love the fat quarter bundle from Moda – Sweetwaters Countdown to Christmas! thanks! I am a follower. Love the Gelato Tonga Batiks – pretty! Thanks for the chance! If I had the money, the Flurry FQB would have made its way into my cart!! My fave would be the Swoon kit!! Thanks for having this giveaway. The Fat Quarter Shop's black Friday sale has soo many goodies to choose from. I think I like the Bella solids. I never use them and thought it might be a nice touch in a quilt. I like the Square Dance Quilt Kit too! I am a follower. I'd have to pick the Amelia fat eighth bundle. I have loved that line ever since I first saw the preview in a magazine and I have yet to get some. My favorite would have to be the fat quarter bundles at such great prices. The top on the list of those I love is the Santa's Little Helpers. Those fat little santa Sock Monkeys are just too cute. Fat quarter bundles..Yippee! I guess I'd pick Countdown to Christmas if I had to choose just one. Thanks so much! Timeless Treasures Fabrics is an adorable bundle. I'm sad that the fabric want isn't in the sale bundle. I might still get it with the 25% off coupon…we'll see. The swoon pattern is on my list for Santa, and I just love that they have it kitted! My favorite was the Retro Basics fat qtr. bundle. Would love to win your patterns! My favorite: Amelia Bundle by Me & My Sister Designs. Thanks for the chance. Winning these would set me up for years! My favourite item is the Happy Remix FQ bundle by Ann Kelle – might just have to get it! Would love to win your patterns. My fav is the Ladybug Dots Crazy for Dots and Stripes Twice the Charm. Thank you! Fa la la la la by French General is one of my favorites from the Fat Quarter Shop. The prints and colors are so cheerful! Thanks for another fun giveaway. I would love the Darks Bella Solids jellyroll. Thanks for a chance – those all look like great patterns. My favorite was the Swoon kit and of course bundles of fabrics that were AWESOME deals!! Oh and gosh those little charm packs for $6 bucks would make great stocking stuffers for quilting friends. Thanks for the chance of a win and of course I'm a follower and a fan! I would love OOh-La-La fat quarter bundle. Love that fabric. I really like the Decorated Palace Grand Bazaar Fat Quarter Bundle . . . Thanks for the chance! As you have notied I am in love with GARDEN JEWELS,so my fave would be the kit!!! I would love to win your patterns and in casa I do , I can pay for the shipping, ok? Wow! Lots of bargains there! I love the Square Dance Quilt Kitas my one choice. I also love La Petite Ecole Fat Eighth Bundle French General for Moda Fabrics . Thanks for the giveaway. I barely could choose just one. I am a follower and love your blog. My favorite FQS Blowout item is the "Coming Home" Charm pack by Deb Strain. Thanks for a chance to win. I would have to say the "Jovial" Jelly Roll..have 2 of the charm packs so this would add to the quilt size! Love you newest patterns. Thanks for the chance to win. I love the Northern Cardinals Charm Pack. hose colors look great together. I am a follower, and thank you for a fantastic giveaway!! rich colors [lotsa greens] and pretty patterned fabrics. nice! This is a blowout sale at FQS. First choice would be your Square Dance kit+backing set! I have about 5 more bundles I would like too! Good luck to you with all your patterns! This is a great giveaway, i love your patterns! My favorite sale item is I Heart Flower Shop. As a matter of fact I am going to order some now. Great deals at FQS, I'm looking at the Warm Memories FQ Bundle! I love your patterns too! The Flurry fat quarter bundle is really calling my name…. Flurry jelly roll. Thx for the chance to win! Warm Pastels Bella Solids layer cake, it has all the prettiest colors that would go with my newest fabrics! "Ready, Set, Snow" fabric bundle! Love the fabrics and the name makes me smile! My favorite would be the Swoon quilt kit. I just love that quilt. Oh my favorite has to be Anne Kelle Happy Remix! Hope your holiday was terrific, now we are counting down! Too much to chose from but I love the sorbet! Well the "ooh la la" bundle is cute, as is the name! My favorite is the Cattails & Clover fat quarter bundle. Thanks for the giveaway, I am a follower. With out a doubt my favorite thing is the fat eighth bundle of Amelia. I've had my eye on that fabric since it was released (and now the new line by the same designer "Twirl".) Definetly on my Christmas wishlist! Kansas Troubles Quilters for Moda Fabrics. Thanks for the giveaway! My favorite on Fat Quarter Black Friday Blowout is the bundle of fat eighths of Amelia by Me and My Sister. Thanks for the giveaway and the chance to win. 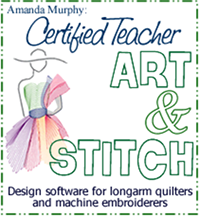 You know by now that I'm nuts for your patterns….I'd love the Square Dance kit! Gorgeous in Veranda! Thanks for the chance to win! My favorites on the Fat Quarter Shop Black Friday Blowout Sale are Flurry, Ready Set Snow, and Amelia. It seems I always have more than one favorite. Thank you for such a cool giveaway. My favorite from the Black Friday Blow out sale is either Count Down to Christmas fat quarter bundle or Ready, Set, Snow fat quarter bundle. Love your patterns…thanks for a chance! Westminster fat quarter is the one I like at Black Friday Blowout. Thank you for such a nice giveaway. I, too, like the Christmas fabric…especially Ready, Set, Snow by Moda. It would make a perfect wintertime quilt for a modern look. I like the retro basics fat quarter bundle. Thanks for the chance to win at such an awesome shop! I love the Warm Memories fat quarter bundle. But I could have picked many more! I am loving the fat quarter bundle of Jovial by BasicGrey. I am a subscriber and follower and have been I love the Rosemary Primatex Basic FQ Bundle by Robert Kaufman, but I really love the Square Dance quilt Kit. Oh my favorite is the fat eighth bundle of Amelia at FQS. 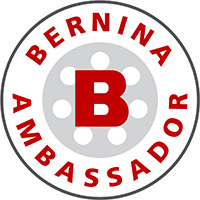 I am a follower under esterling1923 at gmail dot com and an email subscriber under bimbi9 at verizon dot net. Thanks for a chance to win. I love the "home sweet home" quilt kit. So cute! I just became a follower, too! Just because the colors are all fun and the patterns are cute! I really like the fat quarters of Christmas fabrics. They would be so handy to have in my stash. I really like that Flurry by Kate Spain…but they have a pretty great selection! I'm a follower…thanks for a chance to win! I am in love with your patterns. Thanks for a chance to win. Love the look of Carmel and Cocoa. At the Fat Quarter Shop I really like the Kansas City Catails and Clover fat eights. I think a bundle of Bella solids would be my choice……but not sure which colorway. Love your happy patterns! And I really enjoyed your FQS interview. Any of the Christmas bundles would be my first choice too~ love Ready, Set, Snow. 🙂 Thanks for the fun!! I really love the Sweetwater – Countdown to Christmas FQ bundle!! Wow, it was hard to choose but Garden Sampler is my favorite! Thanks for the giveaway! So very hard to pick…there are some really awesome things on there…but if I had to pick I would say the Sweetwater "Countdown to Christmas" FQ Tower…oh what fun I could have with that!! I love the mystery block kit backing set!!! I've already ordered two! I still haven't gotten any Countdown to Christmas. I really need to. My favorite is the Confetti Petite Dots fat quarter bundle. I was admiring Flurry Fat Quarter Bundle by Kate Spain for Moda Fabrics on the Fat Quarter Black Friday sale. I love the Amelia bundle! I love the Oliver + S Cape Ann fat quarter bundle. The fabric is so sweet. Thanks for the amazing giveaway. The Flurry FQB caught my eye right away! Love, love your patterns and they are definitely on my Christmas wish list. I think I like the Bella Solids the best at Fat Quarter Shops sale! I love the Amelia Fat Eighth Bundle. My favorite FQS "Black Friday Blowout" item is the Gingerbread Holiday Fat Qtr bundle. I want to make new stockings for the whole family this year. My favorite item at the Blowout (this time through) is Kaffe's Collective fat quarter bundle. I really like your patterns, they look very do-able. Thank you for the chance to win them! I don't know if I made it in time, but I love the Happy Remix bundle! I love FQS Blow Out Sale on aATisket A Tasket Kit, and all Bunny Hill. I love all your patterns and would love to win them. Crazy for your patterns and fabric. Thanks for a chance to win. I love Garden Paths. All of the patters are great. Bejeweled is a favorite, too, because I am adicted to that game! I love your designs and your blog. I just signed up to follow you so I'm looking forward to seeing more! Love the Beflowered quilt design! i love the garden jewels kit. Christmas fat quarter bundles are amazing! I likednthe swoon kit (I bought it)! If it's a batik, it's my favorite! Sweetwater count down to christmas! I agree with you Amanda, any of the Christmas FQ bundles would please me so much. I am trying to win the patterns for my sister. she would flip if she got these from me for Christmas. Tahnks for the chance to win.